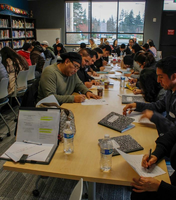 The LLI (Latino Leadership Initiative) Orientation was held Saturday, December 8, 2018 at Edmonds Community College. This event started with a welcome by Diana Bustos, Program Manager, Center for Student Cultural Diversity and Inclusion. Dr. Amit Singh, the new president of Edmonds Community College, gave an inspirational presentation on the nature of US education and its power to advance the lives of citizens. The students accepted the participation requirements and expectations with open arms. These students want to be leaders in their community. Dr. Jose Garcia-Pabon and Rosario Reyes, founder and president of LETI, facilitated a journal writing as a tool for effective leadership. A networking lunch was provided in which the students learned the importance of service. Next, their Learning Project Guidelines were presented by Dr. Diana Morelli with the Latino Business Retention and Expansion, a division of the Economic Development Alliance of Skagit County (EDASC). During the next teaching, Dr. Antonio Sanchez educated students on their history and the contributions of Latinos in Washington state. There was a team building activity designed by Beth Wangen, Volunteer Coordinator WSU- Extension Snohomish County 4-H Program. To close out this event, a training called "You Are What You Decide To Be" was given by another guest speaker Gladis Lasprilla. She is a Gestalt Psychologist and Personal Coach. The training stressed the importance of self-care. Her teaching on how to be kind to yourself was acknowledged by the students with positive expression of personal strengths. Overall, the orientation was successful and an experience never to be forgotten. If you were unable to signup for LLI this year, there will be future opportunities.